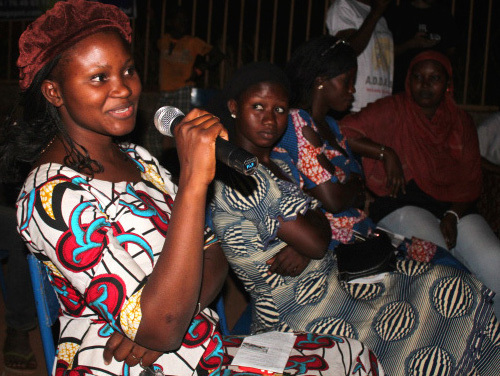 Pitch: Movie – screening tour followed by public debate across Mali in order to carry out awareness raising actions to assert the right of domestic workers in Mali National. 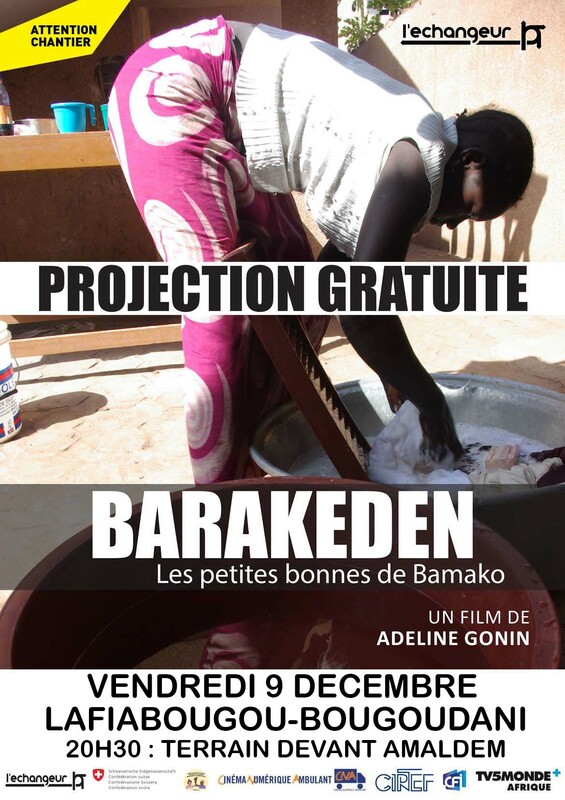 Activities: Tour in four areas distributing the documentary film Barakeden, les petites bonnes de Bamako. – To raise awareness of young girls and public opinion on the maid’s rights and on the support they can have. Actions: organization of screeing-debates in presence of rural and urban communities in coordination with local organisations, media and international NGOs that specialise in the issue of child and distribution of information material on the rights of domestic workers. national tour and 1 short film on child labour and seasonal migrations of young girls. In West Africa and especially in Mali, more and more teenage girls leave their villages to become maids in the City. Poverty and forced marriages scare them away and prompt them to leave the countryside in the hope of a better life. But often what they find is a living hell. Some of them arrive in the City at the age of 9, they endure endless days of work for a pittance, and suffer violence and humiliation. Some organisations try to help them, in order to really change the situation though it would take a wake-up call of the entire society. One of the most efficient ways to reach this goal is to organize screening-debates for a wide audience, of a film giving word to the maids themselves. 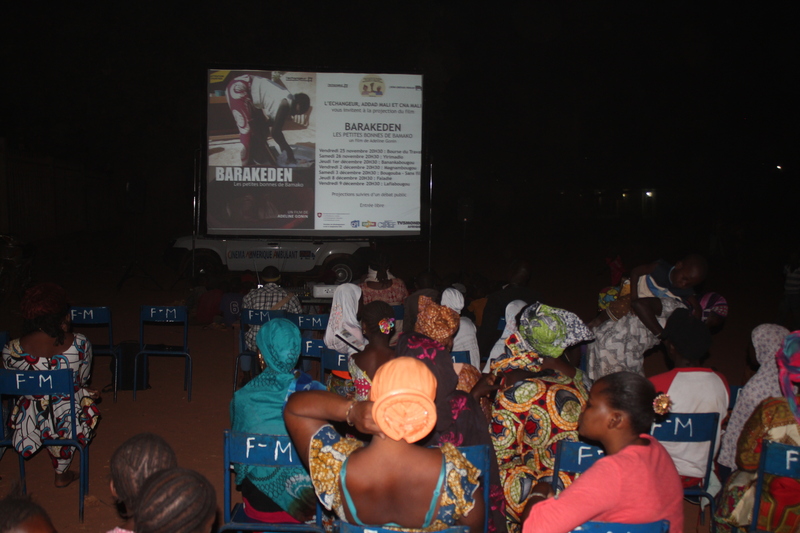 The film Barakeden, the little house maids of Bamako, achieved in 2015, is the perfect base for such screening-debates. The aim of the project is to organize 30 screenings in 4 areas in Mali, in order to reach all communities et socio-economic classes (rural or urban populations, popular or wealthy classes). Each screening will enable a debate between the audience, the maids – after being trained to debates techniques – and specialists on the matter, in order to create a dialogue with villages populations, employers and urban elites. The distribution of the films aims to provoke a wake -up call and promote social changes on child labour in general, and conditions of maids coming from the countryside in particular. The underage maids from rural backgrounds work 17 or 18 hours a day, without a break, for monthly a salary sometimes lower than 5 000 fcfa (not even enough to buy a loaf of bread a day). That is to say ⅙ of the legal minimum wage (28 460 fcfa) for a working time generally two times that of the legal one. They literally do everything at home: cleaning, shopping, cooking, washing dishes and laundry, watching the kids… Often, they’re despised, insulted, abused, beaten up or even raped. It’s not uncommon for their employers to steal their savings or to refuse to pay them after months or even years of work. They are particularly at risk of venereal diseases and unwanted pregnancies. And when they do get pregnant, they are generally left out on the streets and bound to prostitution. The main explanation for young maids to be vulnerable takes place in their isolation and absolute lack of knowledge of their rights. They are unable to negotiate their wages or their tasks as well as to refuse the advances of the men in the house. When raped or when they do not receive wages, they don’t press charges. Some associations try to help them but the number of girls they reach is little in comparison with the total number of maids. Only a wide-ranging sensitization campaign could permit the situation to evolve. The rally of maids themselves, demanding decent life and labour conditions, also appears to be indispensable. This film is dedicated to the maids, now come for them the moment to appropriate this tool in order to involve their rights. This film speaks for their suffering and their expectations. It’s a way, for a large audience, to realize how hard and long can be a work day, and what they wish for. The film will also approach other subjects, related to the phenomenon of maids: child labour, seasonal migration, life conditions in villages, forced marriages…Favorishing debates on those matters, the audiovisual tool constitutes a lever for social integration of all. 1,000 information leaflets and 15,000 flyers informing about the basic rights of domestic workers and giving the contacts of key support persons where they can get help and advice. 500 flyers are distributed during each screening in the towns and villages of Mali. Publicity plan of the documentary film and the tour: concurrent multicast broadcasting of the movie on television ORTM and TV5 Monde; radio spots and trailer « short sketch » informing about the dates and venues of the tour and the basic rights of domestic workers, via radios (RFI and local radios) broadcasting and on social networks; trilingual DVD edition handed out to the movie crew, associations, elected officials and village leaders during the tour. L’Echangeur is the administrative project director and is also in charge of the artistic direction and coordination of the screening and awareness raising tour. The CNA is implementing the cultural and technical aspects of the project through the organization of the public screenings­debates in consultation with the authorities and in partnership with local communities as well as via the moderation of the debates.